"When magic is used to create worlds unexpected things happen." Thirteen families of the fae end up travelling to a new world after using up all the magic of their old world and in an attempt to stop this from happening again they create a web of many different magical worlds. This is a collection of stories set on these worlds, about the people who live there, and how magic doesn't always work the way you want it to. The collection is updated irregularly currently. The stories posted are scattered around the timeline (mostly later in the timeline at the moment), and the write more button at the end of all posts can be used if a reader wants more of any particular story. The World Walkers Collection has not been tagged yet. 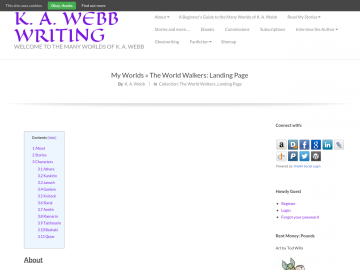 Help others find The World Walkers Collection by tagging it! The World Walkers Collection has not been reviewed yet. The World Walkers Collection has not been recommended yet.